I’ve won an Outstanding SQLPass Volunteer Award! I’m amazed, elated and honoured to receive the Outstanding PASS Volunteer Award today! I got a lovely surprise email from the SQLPass team, saying that I’d been nominated for the Award and I’d like to express my humble thanks to the SQLFamily person who nominated me anonymously – it was a lovely gift from nowhere, which I didn’t expect! 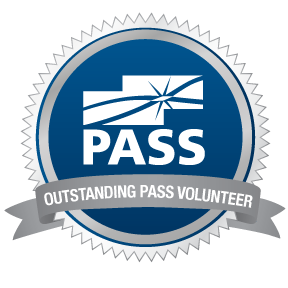 If you’re thinking of volunteering for SQLPass events, I’d recommend that you ‘go for it’. It’s been life changing for me to become involved with SQLPass as a volunteer. I am proud and privileged to call people in the SQL Server community as firm friends and SQLFamily, and some of the best, kindest hearts are to be found in this community. If I hadn’t got involved in PASS, I wouldn’t have met so many ‘gems’, who have uplifted me and, without knowing it, have even revived my belief in the good side of human nature. Being part of the SQL Family is very important to me, and I think to myself sometimes that I get every bit as much back from the SQLPass community, as I put in. So if you’re thinking of joining SQLPass – please don’t hesitate. Being part of PASS is one of the most fulfilling things I’ve done, both personally and professionally since I’ve learned so much from my fellow SQL Server friends and community leaders. .. the list of the different opportunities is long, and means that there is something for everyone who wants to know more about SQL Server, and perhaps share their expertise too! Before I go, here is the awesome logo which I’m now delighted to display on my blog! This entry was posted in SQLPASS, SQLServerPedia Syndication. Bookmark the permalink. That's so wonderful, Jen. I'm happy your hard work is recognized.